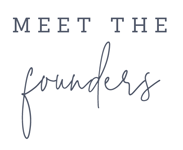 We're so thrilled to have the chance to interview one of our VERY favorite calligraphers in the industry, Jenny Sanders. Not only does she do gorgeous lettering, but Jenny also creates the most beautiful custom illustration using watercolor. Her whimsical approach to her designs are captivating. We're excited to have you get to know this sweet friend of ours today! A few basics: I am a calligrapher and illustrator in Portland, Oregon. I love Jesus, my husband John, our rabbit Kirby, my family, grey skies and all things white. My favorite days are calm and grey ones spent with my husband and not chasing deadlines. Coffee or Tea: It used to be coffee during the day, tea at night, but lately I have been in a tea-all-the-time mood – pretty much all decaf or my hand gets too shaky to write! Where can we find you on a Saturday morning? Petting our rabbit Kirby with a cup of tea or coffee then off to brunch with my husband + maybe a trip to the farmers market. 1. How did you get started as a hand letterer/calligrapher? I have always loved lettering – my notes in high school were always fancy! I left that love for a while + studied accounting but picked up calligraphy around the time of my wedding and then when I was laid off from my corporate job it gave the opportunity – and push – to try to make a career out of my art. 2. What is one thing you have learned the hard way as a business owner? Oh dear, there have been many! One that comes to mind was that the first time that I had my clients return address printed and ordered custom stamps, I did not measure the stamps – which were much bigger then the normal stamps and there was not enough room for the stamps. I had to race to paper source, buy more envelopes, redo the print file and then have them reprinted. I now always make sure I measure the stamps! 3. How do you approach creating custom work for clients? Do you prefer people approach you with an idea, mood board, etc.? I always being with a telephone call to get to know them. Whether it is a bride or a logo client. Listening their story and what they are all about gives me insight to what type of work that they will be drawn to and how we can create pieces that truly convey who they are. Of course mood boards can be helpful, but not a mood board filled with other stationery suites or logos. I love when a clients bosrd is just images of nature, textures, and images that evoke a certain feeling. That is what is the most inspiring and that way we are really creating something that is unique to them and not trying to imitate something that has already been done. 4. How do you decide which projects to take on and which to pass up (if any)? God has been so good and I have been very fortunate to mainly get to work with clients that I love and whose projects I am very interested in so having to turn down clients due to it not being a project that feels like a good fit has not really been an issue for me. I keep my branding and marketing (aka instagram, ha ha) very consistent to the style that I like and feel most comfortable in so I tend to get inquiries in the same styles. I would say to trust your instincts – if a client or project gives you a feeling that you are unsure, follow that intuition! 5. Whats been your most memorable project to date and why? Oh goodness, how would I choose that? I have had some really amazing clients + suites that I have really loved, but I would have to say that getting to work with the team on The Mrs. Box for their last two launches was such an honor! I was humbled to be working with such amazing people on that project! 6. 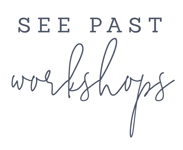 You offer workshops, tell us a little about that. I teach pointed pen + brush calligraphy as well as watercolor classes, either on my own or as part of larger workshops – like Bloom! Those are the best because though I love teaching, setting up out of town classes and coordinating everything is not my strength! As I am self-taught, beginning to teach was super intimidating for me as I always questioned if I was teaching something ‘wrong’ like with anything, the more I did it the better and more comfortable I became. I still think that I learn how to improve or a better way to explain something with each class! 7. What has been the most rewarding part of your business? The extremely humbling experience of having people tell me that my work encourages + lifts them up. God has given me a little bit of talent that I hope to use for His glory + to be a light + source of encouragement to others, but you never know how or even if you are making any difference for anyone. If I can use my God-given gifts to bless others, then that is all that I can ask for. 8. You taught at Bloom Bash this year! What was your favorite part? Get to meet all of the wonderful speakers + attendees + spend the days creating together + building each other up! Owning a small business is hard. work. We all need some downtime to build community + fill our creative wells! 9. What is your best piece of advice for someone hoping to do the same type of creative work you do? Know who you are and develop your own style. That is what will set you apart. Build relationships with others and don’t be afraid of ‘the competition’ instead see your fellow vendors as your community! Don’t get discouraged believe that you can do it! Give yourself grace and know that you are special and unique and have something to offer that no one else is offering! 10. Favorite products/papers/inks or any other fun things you want to share? Goodness, there are many things that I use. Right now my favorites for calligraphy are the plain old speedball plastic oblique holder -- only a few dollars! -- either layout bond paper or Bristol for writing, and the Brause 361, Nikko g, and Leonardt 41 for nibs. For watercolor I love arches cold or hot press paper – depending if i want texture or not. I use Simply Simmons brushes – again, will not break the bank! and Grumbacher academy $ or Winsor & Newton professional $$ for watercolor. Thank you for being here with us today, Jenny! Go say hello to Jenny on Instagram + take a peek at her beautiful shop full of gorgeous prints!